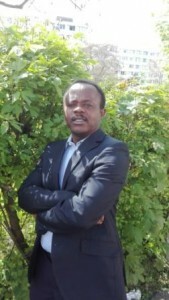 Daniel A. Nkemleke is professor in English language and linguistics at the Ecole Normale Supérieure, University of Yaoundé 1, an Alexander von Humboldt (2007-2008, 2011, 2013, 2016) and Fulbright (2010-2011) scholar, as well as an Award Winner of the Alexander von Humboldt Alumni Prize for Innovative Research Networks Initiative for 2014—a prestigious international award that has been honored by the German president and president of the Humboldt Foundation. He has more than 30 publications in peer-reviewed journals in Europe, North America, Asia and Africa, and currently editor-in-Chief of Review Syllabus—an interdisciplinary journal of the Ecole Normale Supérieure, University of Yaoundé I. Professor Nkemleke runs an African-German Network Centre for Academic Writing Excellence (AGNETA) that provides a platform for mentoring junior scientists in view of preparing them for successful Humboldt applications. AGNETA brings together scholars and junior scientists in the humanities from five African countries (Cameroon, Nigeria, Ghana, Tanzania, Kenya) and Germany. In 2015, he organized an international symposium in Yaoundé under the theme: “Academic Writing across Disciplines in Africa: socializing junior scientists in the discourses of research, and maximizing their changes for successful Humboldt Applications”. Selected papers from this symposium appear in a new book: Academic Writing across Disciplines in Africa: From Students to Experts (2016), which he has edited with Josef Schmied. His research interest includes general linguistics, ELT and academic writing from a corpus-based perspective. During the last five years, he has been investigating academic writing practices in Cameroon English from a corpus linguistic perspective, and his book Exploring Academic Writing in Cameroon English (2011) is the outcome of this initiative. Has over 35 publications in refereed journals, book chapters etc. 2016 Schmied. J. & D. Nkemleke (eds.). Academic Writing across Disciplines in Africa: From Students to Experts. Gottingen: Cuvillier. 2011 Nkemleke, Daniel. Exploring Academic Writing in Cameroon English: A corpus-based perspective. Gottingen: Cuvillier. 2018 Nkemleke, Daniel. Practical Corpus Linguistics: designing and exploiting a written corpus for research with reference to Cameroon English. In Esimaje, A., Ulrike, Gut & Bassey, A. (eds.) Corpus Linguistics and African Englishes, John Benjamins Publishing, 165-182. 2018 Nkemleke, Daniel. Modality, Hedging and Nominalization in Cameroon, East Africa and British English from a Corpus Linguistic Perspective. In Afutedem, L., Nkwetisama, & Fai Tarka, G. (eds. ), Language and Literature Sciences in Contemporary Cameroon and Commonwealth, 148-170. 2016 Nkemleke, Daniel. Analyzing research article introductions in the humanities using the CARS Model: How genre knowledge can enhance academic writing skills of junior scientists. In Schmied J. & D. Nkemleke (eds.) Academic writing across disciplines in Africa: From Students to Expert, Gottingen: Cuvillier,35-58. 2014 Nkemleke, Daniel. Researching the research paper in Cameroon English. Brno Studies in English, vol. 40(1), 175-203. 2013 Nkemleke, Daniel. Towards a corpus-based methodology for contact linguistics: investigating variation in African Englishes. In Akande A. T. & Taiwo, R. (eds. ), Contact Linguistics in Africa and Beyond. New York: Nova Science Publishers, 41-59. 2012 Nkemleke, Daniel. Variation in written discourse: comparing Cameroonian, East-African and British English on the basis of text corpora. Language Forum, vol. 38(1), 23-39. 2012 Nkemleke, Daniel. A corpus-based investigation of lexical bundles in students’ dissertations in Cameroon. Syllabus Review 3 (1), 1–20. 2011 Nkemleke, Daniel. Assessing a culture of religious devotion in Cameroon: Comparing word frequencies in the corpus of Cameroon English with reference to the London/Oslo-Bergen (LOB) corpus. Journal of Language and Culture vol. 2(1), 6-14. 2011 Schmied, Josef & Nkemleke, Daniel. Reference, Coherence and Complexity in Students’ Academic Writing: Examples from Cameroon and East-Africa corpus. Indian Journal of Applied Linguistics, vol. 37 (2) 19-44. 2010 Nkemleke, Daniel. Cameroonian and foreign scholar’s discourse: the rhetoric of conference abstracts”. World Englishes 29 (1), 173-191. 2010 Schimed, Josef & Nkemleke, Daniel. Prepositions in Cameroon and Kenyan English: Corpus-linguistic comparisons of simplification and expressivity. Review Syllabus, vol. 1 (2), 31-48. 2010 Nkemleke, Daniel. Methodological issues in the teaching and learning of English as a foreign language”. Journal of Educational Reforms vol. 3(1), Yaoundé: CIPCRE, 10-25. 2009 Nkemleke, Daniel. Frequent collocates and major senses of two prepositions in ESL and ENL corpora”. Indian Journal of Applied Linguistics vol. 35 (2), 69-85. 2009 Nkemleke, Daniel. Review of Jean Paul Kouega’s A Dictionary of Cameroon English. English World-Wide: A Journal of Varieties of English 30 (3), 338-343. 2008 Nkemleke, Daniel. Modality in novice academic writing: the case of African and German university students. Research in English & Applied Linguistics REAL 4: English Projects in Teaching and Research in Central Europe. Göttingen: Cuvillier, 43-64. 2008 Nkemleke, Daniel. Frequency and variety of if-constructions in Cameroon English. English Studies and Language Teaching. Plzen: University of West Bohemia, 27-40. 2008 Nkemleke, Daniel. Please-request in Cameroonian and Kenyan private (social) letters. Discourse Interaction 1(2). Brno: Masaryk University, 63-74. 2007 Nkemleke, Daniel. Frequency and use of modals in Cameroon English and application to language education. Indian Journal of Applied Linguistics, vol. 33(1), 87-105. 2007 Nkemleke, Daniel. Frequency and use of modals in Cameroon English. Lagos Papers in English Studies, vol. 1(2), 47-61. 2007 Nkemleke, Daniel. “You will come when?” The pragmatics of certain questions in Cameroon English. The English Linguistics, vol. 2(1), 128-142. 2006 Nkemleke, Daniel. Some characteristics of expository writing in Cameroon English. English World-Wide: A Journal of Varieties of English vol. 27 (1), 25-44. 2006 Nkemleke, Daniel. 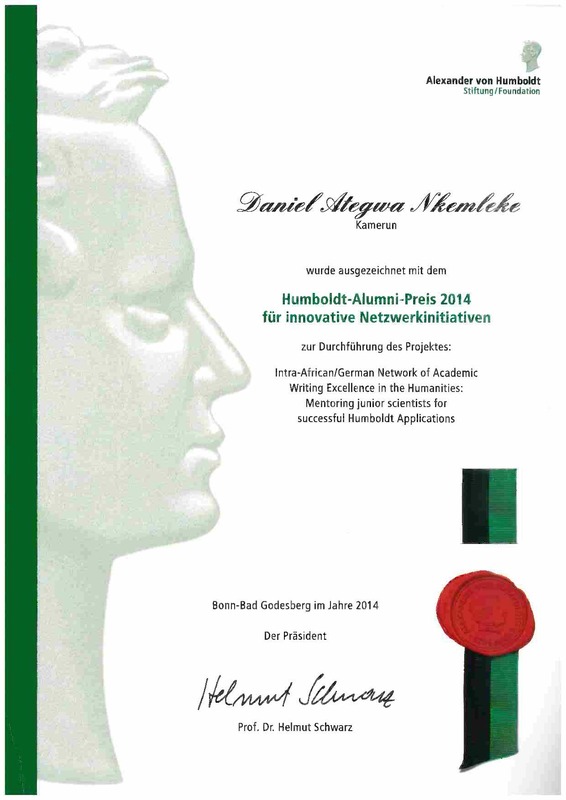 Nativization of dissertation acknowledgements and private letters in Cameroon. Nordic Journal for African Studies. vol. 15(2) 166-184. 2005 Nkemleke, Daniel. Must and Should in Cameroon English. Nordic Journal for African Studies, vol. 14 no. 1, 27-67. 2004 Nkemleke, Daniel. Job applications and students’ complaint letters in Cameroon. World Englishes, vol. 23 (4), 600-611. 2004 Nkemleke, Daniel. Context and function of Need and Be able to in Cameroon English”. Indian Journal of Applied Linguistics, vol. 12 (2) , 23-34. 2004 Nkemleke, Daniel. A corpus-based study of the modal verbs in Cameroonian and British English”. CASTALIA: Ibadan Journal of Multicultural & Multidisciplinary Studies, vol. 1(19)1-23. 2001 Nkemleke, Daniel. with Paul Mbangwana) The modals of obligation and necessity in Cameroon English. CASTALIA: Ibadan Journal of Multicultural & Multidisciplinary Studies, vol. 6, 1-14. 2006 Nkemleke, Daniel. Technology and the English language. The Encyclopaedia of the Arts, vol. 4(1). Faculty of Arts, Lagos State University, 12-21. 2006 Nkemleke, Daniel. Clause types in English. The Encyclopaedia of the Arts, vol. 4 (3) Faculty of Arts, Lagos State University, 216-221. 2008 Nkemleke, Daniel. Manual of information to accompany the corpus of Cameroon English. Department of English, Chemnitz University of Technology, Germany: 47 pages. 2003 Nkemleke, Daniel. A corpus-based study of the modal verbs in Cameroon written English. Unpublished PhD thesis. University of Yaounde I. 2009 Nkemleke, Daniel (2009). “Review of Jean Paul Kouega’s A Dictionary of Cameroon English. English World-Wide: A Journal of Varieties of English 30 (3), 338-343. 2018 2018 (May 14-20), participated and presented a paper at a European Research Council-sponsored International Workshop at the Faculty of “Artes Liberales”- Centre for Studies of Classical Antiquity (OBTA) in Warsaw, Poland under the theme: Our Mythical Workshop II, The Present Meets the Past. 2017 2017 (May 15-21), participated and presented a paper at a European Research Council-sponsored International Conference at the Faculty of “Artes Liberales”- Centre for Studies of Classical Antiquity (OBTA) in Warsaw, Poland under the theme: Our Mythical Hope in Children’s and Young Adults’ Culture: The (In) efficacy of Ancient Myths in Overcoming the Hardship of Life. 2014 2014 (November 14-20), participated in an e-learning training seminar in Stuttgart, Germany. Co-ordinates the activities of AfriG-CAWE (African/German Network for Academic Writing Excellence: advising junior scientists in the Humanities on project writing and publication, in view of preparing them for Humboldt scholarship. Network members are in six countries: Germany, Cameroon, Nigeria, Ghana, Kenya, and Tanzania. Coordinates the African research component of the ERC (European Research Council) Grant Consolidator Project, with the PI (Principal Investigator) in the University of Warsaw, Poland. This project aims to build an on-line database of the reception of Classical Antiquity in the literature for Children and Young Adults, as part of a world-wide bank of Antiquities including African Mythology and Folk-Tales. Has compiled other specialised academic corpora on which my book is based on (1,000,000 words). This database is the material for the book: Exploring Academic Writing in Cameroon English (Nkemleke, 2011). The project was funded by the Humboldt Foundation. He heads the African team (headquarter in Cameroon) of researchers involved in a European Research Council (ERC) Project (2016-2021)—a consortium of five universities—Our Mythical Childhood (OMC), which aims at writing survey entries for Children and Young Adults’ Literature and Cultures, including Myths across Africa. The Principal Investigator (PI) is based in Warsaw, Poland. My current research involves exploration of English second language databases in comparison to other academic databases of experts’ writers in English, using software (corpus linguistics), and how this can be used as a basis for academic writing instruction in tertiary education. My teaching and mentorship activities centre on junior scientists in the humanities, who struggle with international publications and project writing at various levels. We run an International Network of Academic Writing Excellence involving colleagues and students from universities in five African countries (Cameroon, Nigeria, Ghana, Kenya, and Tanzania) and Germany, in which we mediate their texts, provide information on conferences and publication outlets at national and international level.